Are you ready for another fun theme for Tag It Tuesday?? I bet you think I'm going to do something traditional to the month of March, like shamrocks, leprechauns and the color green. Well, guess what? I'm not!! This month's theme is steampunk/industrial/grunge. See.....I told you it wasn't what you would think! Not sure what that theme entails? My vision of it might include gears/sprockets, clock faces, antique cars and planes and trains, hot air balloons, top hats, monacles/goggles and so much more. Other recurring items in the genre include butterflies and dragonflies, old fashioned bicycles, architectural elements and drawings, skeleton keys .... I could go on and on, but I think you get the idea. Just do an internet search and you'll find a wealth of inspiration. 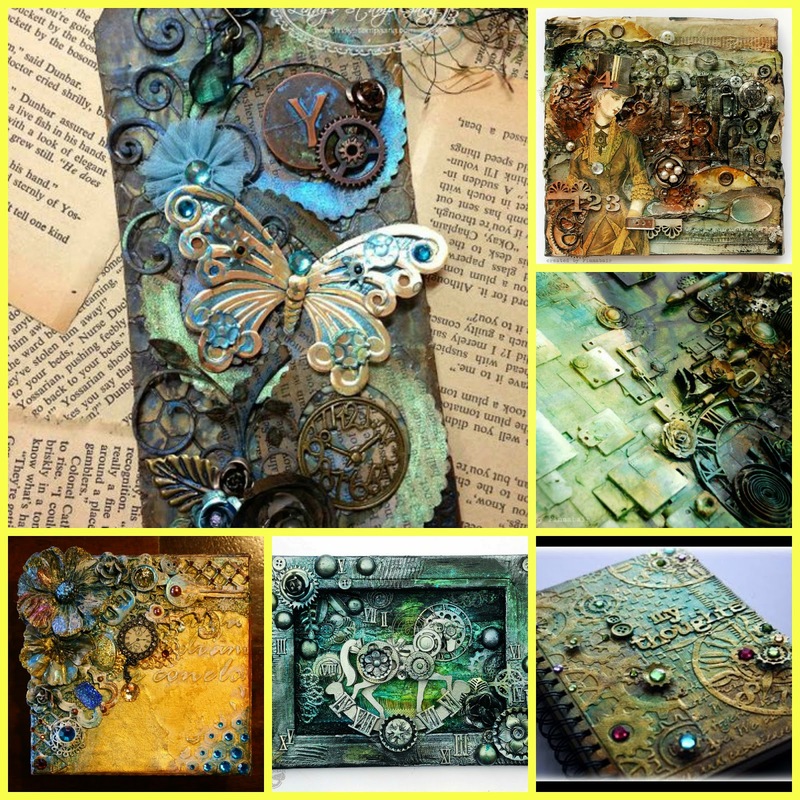 And don't forget my altered tags Pinterest board. You'll find some ideas there as well. Here's a little pictorial collage for inspiration. So it's time to get busy creating your tag! The actual link up post will be published on March 17th, so you have plenty of time to play and create! I'm really looking forward to seeing what you all come up with! I definitely encourage everyone to use what's in their stash, Felicia. I'm really looking forward to seeing how everyone interprets this theme...myself included! oh boy this is the one area I have stayed oh so far away from...I guess that is the "challenge" part of it!! Oh, Heather, I know how creative and talented you are! I have no doubt you can stretch outside your comfort zone and embrace this month's theme! You know, I've been working on tags since you started this challenge. I know I never get around to posting any...I so need to come up with something for this month!! !